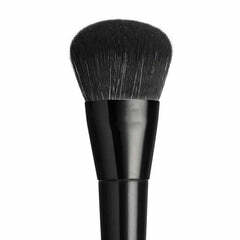 With the must-have pro powder brush, you can apply powder seamlessly to create a smooth and even complexion. Its wonderfully soft and fluffy bristles offer a seamless application, while its premium shape guarantees the most professional results. Its bristles are made with the latest technology in vegan cosmetics, creating a cruelty-free way to enjoy your favourite makeup tools. 22cm full length. Bristles - 5.5cm high, and 5cm wide.